Software development is one of the most complex and high-risk endeavors that any business can attempt. The rates of change in the marketplace and technology that confronts most software projects is enormous. To overcome these challenges, decision makers must make use of a combination of business, project management, marketing, and technical skills that no other industry in human history has ever required. Each of these four skill sets has a different focus and each has developed its own unique language to communicate its particular point of view. Finance types speak of revenues, costs, expenses, investments, and profits. Project managers are more interested in schedules and the best use of scarce resources. Those focused on marketing are more interested in market conditions, product appeal, product niches, salability, feature sets, competition, and customer reactions. Engineering managers are quite content to leave these issues to those in the “front offices,” instead preferring to focus on the technical challenges of developing a product with a rich, cutting edge feature set and having fun doing it. It is rare to find leaders who speak more than one of these languages fluently. This difficulty in communicating between these fundamental business disciplines pervades technology development, but seems to hit software development particularly hard. This nexus of communication, while a major source of both critical product defects and product development opportunities, is almost completely neglected by the processes favored by each individual discipline. There is only one branch of software development whose primary focus is this very nexus – Software Quality Control. Remarkably, what may be the most profitable aspect of software development is often the most neglected. No one wants to overspend on product development. But the costs of releasing poor quality software are significantly greater than most people assume. Many development managers intuitively “know” this to be true, but relying solely on intuition is a costly mistake. The good news is that there is a goldmine of data right at our fingertips that will guide us to the most profitable level of attention to software quality. All we need to do is use it. 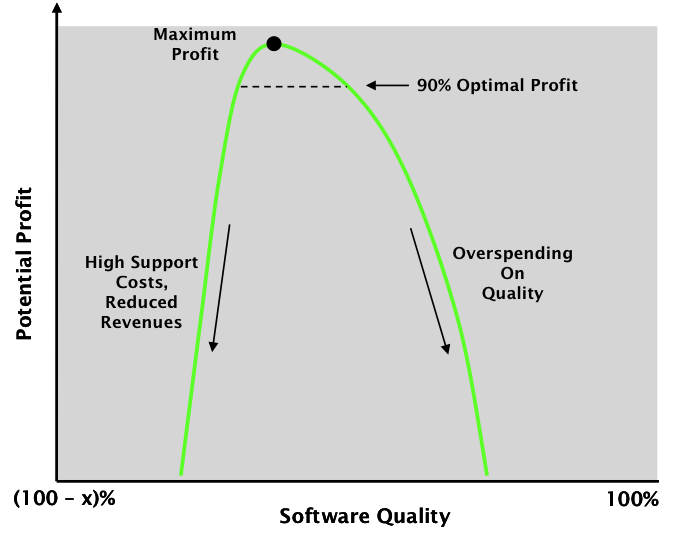 Remember, optimal quality is optimal profit. If you’re ignoring it, you’re wasting money.